Now that the fall chill is in the air..nothing can create a warm filled environment like a real fire burning in the fireplace. Keep in mind that this is not an efficient way to heat your home! “The quality of the wood depends upon many factors, including what kind of tree it comes from and how long it has aged. Different types of wood have different characteristics, including amount of heat, length of burn time, aroma, smoking and sparking. There are many types of trees, and therefore many different woods. 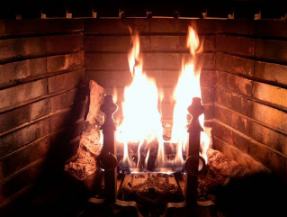 Some of the top woods for burning are: Apple, Ash, Beech, Birch Cedar, Cherry, Hazel, Holly, Hornbeam, Larch, Laurel, Maple, Oak, Pear, Pine, Plum, Thorn, Walnut and Yew. The woods from fruit trees, such as Cherry, Apple, and Plum tend to be the most pleasant smelling. Please also have a screen in place so no sparks fly out and cause damage! Also ask if the wood is seasoned! If it is green it will smolder and will not burn as nicely! And it might just be smokey! “In order to comparison shop for wood, it is important to understand a few terms. Find out is the price is based on a cord, face cord, pickup truckload or some other amount. The manner in which the wood is stacked, what kind of truck is used and how the truck is loaded are all important to know when comparing quantity. Cord: A stack approximately four feet high, four feet deep, and eight feet long. When shopping for firewood, ask if the price includes delivery and stacking. How the firewood is cut and stacked is important, Proper storage of the wood ensures that the wood will continue to season properly. Do not cover the stacked wood with a canopy, it causes the condensation to remain in the wood. Enjoy your fireplace and remember always open the chute!